HOW DO YOU PERCEIVE THE CHAKRAS? If only there were a simple answer to this question. It gets at the heart of an almost theological debate, what is and isn’t a chakra. At the core of the mater, we have a center for focus during meditation. The end. Done. Easy! Contemporary (new age) depiction of chakras being rooted to the central channel (in this depiction it has been medicalized and is seen as synonymous with the cerebral spinal fluid). But wait, there’s more… if you act now, we will throw in, absolutely free – these centers are perceived as flowers in various stages of bloom, spinning wheels, funnels or vortexes, by color, etc. They can be in or out of alignment, deflated, shattered, smattered, covered, smothered, spinning the “right” or “wrong" way, and all sorts of other things. Descriptions from one source to another disagree. If we could just see them, we would know the right answer! But many people claim to see or perceive them, and those people often disagree. So, what’s going on here? Well, putting aside the possibilities of people’s perceptions being heavily influenced by their background and worldview – let's just imagine we aren’t projecting (we are always projecting) but rather we are all seeing the same chakra from an objective place. Would we still see different things? Of course, we would! The subtle body has many layers. If we were to take any given chakra, we would find it has many layers as well. Let’s start at the core. Inside the central channel (Sushumna, ultra-sonic core) we find the root of the chakra. This root is the center-most core of the chakra. Some might argue that this IS the chakra and everything else is just its energy field. That’s fine, so long as we don’t discount the effect that the field can have on the root, and vice versa. Within the energy field of any given chakra we can find a few notable anatomical structures - a nerve structure, a glandular structure, and a fascial or myofascial structure. This is how we find correspondences to glands and nerves in contemporary writings on the chakras. They are in the field of the chakra. They relate to the chakra. They correspond to the chakra. So, therefore, they can be seen as a part of the chakra. So, let’s use the step-down of energy as a framework for building a chakra. 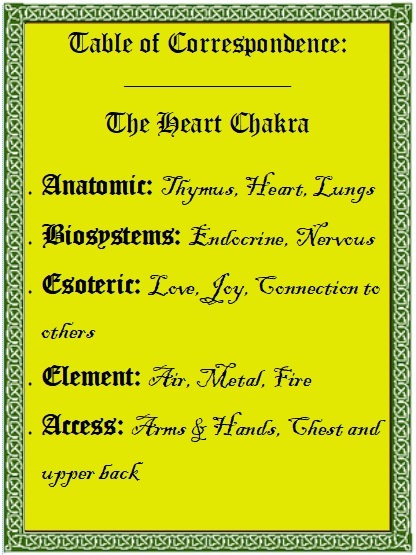 For this exercise, we will take the heart chakra. At the beginning of the transformational process, we have an energetic center sitting in the anatomical location of the seat of the heart. But this is happening “pre-vesical,” or before the organs are formed. Another way of looking at this is at a higher frequency. So, this higher frequency heart chakra is a center of energy or light which can be focused upon, meditated upon, and many manifestations of this center can be perceived - if we step it down, lower its frequency, bring it closer to physical form we find physical structures that correspond to this center. 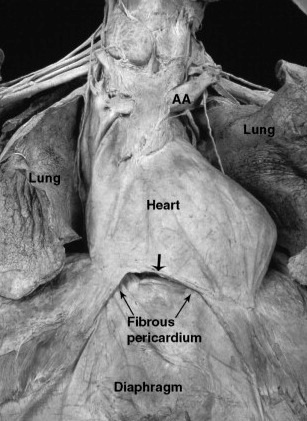 For example, near the perceived heart center, we find a massive fascial structure containing the pericardium, diaphragm, mediastinum, and pleura of the lungs. This structure has plenty of capacity to transmit energy. It’s crystalline in nature, produces its own energy based on tension and contraction. It is also innervated, meaning that it has nerve structures conducting impulses to and away from it. Also, within this structure, we find two important endocrine glands. The thymus, which is both an endocrine and exocrine gland and the heart, which is, many things including, an endocrine gland. So, on a visceral level, we can perceive this massive fascial structure, these physical organs, these nerves… all of which are energetic structures as well. This, for me, is a layer of the heart chakra. One that I would perceive when doing chakra work. Whether that work be my own meditation practice, a structural bodywork session, or an energy healing. Chakra system from Tantra tradition showing the kundilini channels bowed rather than interconnecting with each chakra. Then we step back up in frequency and find some very fascinating correspondences as well. As this energy field projects outward, we find an outward projecting structure which some perceive as a sphere, others a funnel. I’m honestly not sure that either is “right.” That’s the thing about the subtle body; at some point, especially in the higher frequencies, what you intend to perceive, what you think you will perceive, what you expect – is what you get. So, if I expect a funnel, I’m going to get a funnel. If I expect a glowing orb of rainbow light… that’s what I’ll see. Also, the subtle body’s morphic nature might have real-world healing applications. If you are perceiving on the visceral level and not picking up anything out of the ordinary, perhaps you can switch to a funnel image. An example of this natural ability of the energy system to morph to our projected image can be seen when comparing these two meditation practices, from two separate traditions, both designed to work on the kundalini. In the first, we imagine Ida and Pingala in their crisscross pattern swinging up and down the central channel bringing the energy up and down (respectively) and ultimately transferring some energy to the central channel. In the second, we imagine the Ida and Pingala each in a bow shape, on their respective sides. Neither crossing the midline of the body; Ida bringing in the moon’s energy and Pingala the sun’s. Ultimately, we imagine this energy feeding the central channel. We could get hung up on whether the kundalini channels crisscross or bow. Or we can acknowledge both practices work. Thus, we can conclude that the subtle body morphs to our image of it. The chakras, they are similar. We have the deep energetic core of a chakra, the visceral aspects of a chakra and the outward energetic aspects of a chakra. All relative. So how do I perceive a chakra? Many different layers. Hey, fascia enthusiasts & energy aficionados - check this out! Did you know I’ll be teaching an online course in energetic and fascial anatomy? is copyright Stephen C. Alicandro Mace. All rights reserved.